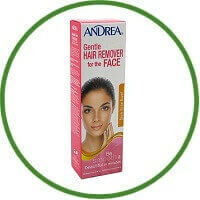 Andrea Natural Wax Hair Remover is salon tested to be gentle enough to use on delicate facial and bikini areas. It leaves your skin silky, smooth and free of unwanted hair for weeks. It is a natural organic product with no unpleasant odours and no harsh chemicals that cause allergies or rashes. No need for chemical depilatories, tweezers, or shaving that leaves nicks, cuts and stubble. Andrea Natural Wax Hair Remover is water soluble, which makes cleaning up any wax left on the skin after waxing away. Just wash off with warm soapy water. Gum Rosin (Colophony), Surfactant, Hydrocarbon Resin, Mineral Oil USP. Andrea Natural Wax Hair Remover should not be used on skin which is sunburned, cut, chapped or sore, or over old, weak scars, nor skin with eczema, nor over varicose veins, moles or warts. It should not be used on the elderly or anyone with loose skin. Consult a physician before using if taking medication. Your hair should be 1/4″ long or longer for Andrea Natural Wax Hair Remover to grip successfully. Clean area with soap and water, then rinse and pat dry. Powder lightly if skin is oily, brush off powder completely. Remove cap. Remove plug. Place tube upright in centre of micro-waveable safe cup. Place cup in centre of microwave on paper towel. Turn setting on high and heat for 60 seconds. Time may vary based on individual microwaves. As with any warm wax, do a patch test first to make sure wax is not hot. Working in a small area, apply a thin coat of the wax in the same directions of hair growth. Place muslin strip immediately on waxed area and rub firmly in direction of hair growth. Muslin strips should be slightly larger than area to be waxed. Hold skin taut and pull off strip in one quick motion in opposite direction of hair growth, keeping strip as close to skin as possible. Do not pull off outwards. Do not peel back cautiously. If you do, the strip will appear to be sticking to skin, which may cause bruising. If you hold the skin taut and remove quickly, the wax comes away cleanly and freely. Immediately apply firm pressure to the waxed area with the cushions of your fingers and palm, and continue waxing.